Paramekkavu Bhagavathi Temple is located in the east side of Swaraj round in Thrissur, Kerala state, South India. The temple is pretty old, there are no records for how much old the temple is. 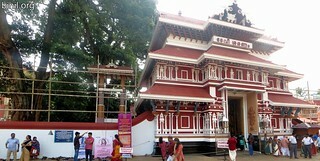 This is one of the main participating temples in Thrissur Pooram. The story behind the temple – a Karanavar (an elder member) of Kuruppal family, who goes monthly to visit the Bhagavathy at Thirumandhamkunnu temple (in Angadipuram, Malappuram) – when he got old and felt that he won’t able to come to worship the bhavathy due to his old age, he prayed with his whole heart on his last visit there. The legend is that the goddess came with him by sitting on his umbrella. On his way home, he stopped to rest at Vadakkumnathan temple under the Ilanji tree. After resting he found that his umbrella was firmly fixed on the ground. So a Devaprasnam was done by astrologers who concluded that there was a presence of chaitanya or divinity of goddess at that site. The Karanavar decided to worship the Goddess there itself. After the consecration of the Vadakkumnathan temple, the chaitanya or divinity of the Goddess was transferred to the present location of the temple under a Paro tree. This became to be known as Parokkavu Bhagavathy, which later became Paramekkavu Bhagavathy. Still the tradition during Thrissur pooram where the famous Ilanji Thara Melam is done to honor the divine presence of the Bhagavathy. Here are some of the pictures of this temple. Also check out other festivities in this temple.